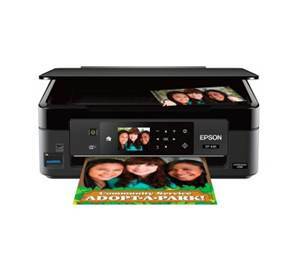 Epson XP-446 can be considered as one among the recommended personal printer by Epson. Other than printing, this machine is also able to scan and copy documents without additional devices needed. This printer has a compact size, with 9.48 lbs. in weight, and 11.8 x 15.4 x 5.7 inches in depth, width, and height respectively. With this size, it does not need extra space in your room and you can move it around effortlessly. It is compatible with several operating systems, such as Windows (XP and above) and Mac OS X (version 10.6.8 and later). The maximum resolution of Epson XP-446 are pretty good for home and personal use, with 5760 x 1440 dpi. The speeds are quite average, with 4.5 pages per minute for color printing and 10 pages per minute for mono printing. The power consumption is very efficient, with 13 watts during operation and 0.3 watts during standby mode. For the connectivity, Epson XP-446 is equipped with both USB port and Wi-Fi to make sure multiple computers can connect to the device remotely. It comes with a 2.7 inch touchscreen as its operational panel to make sure the users can use the device without too much headache.